The city of Norwich has played such an important role in the history of non-conformism in England, particularly that of the the Quakers, the Unitarians and the Congregationalists, that it is fitting to find the country's first non-denominational cemetery, established here in 1819. It was promoted by the Presbyterian minister Thomas Drummond of the Octagon chapel. He paid for the land out of his own savings, partly as a protest against the law which said that all Norwich citizens had to be buried according to the rites of the Church of England in their local parish graveyards, with the exception of those groups with special dispensations such as the Jews and the Quakers. This was in the early days of the Industrial Revolution, and there was not as yet the explosion in population which would lead to the closure of urban churchyards and the opening of municipal cemeteries in the 1850s. At this early date, burial grounds had to be licensed by the local Anglican Bishop, and this happened in 1821 thanks to the theologically liberal Bishop Bathurst, an ecumenist in the days before the word meant anything. It was said that he looked with a benign eye upon these strangers in his midst whom he was bound to think of as part of his flock. 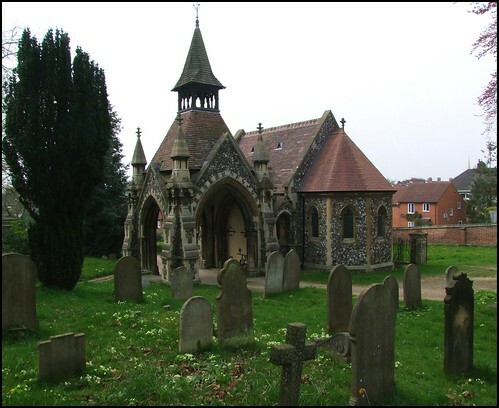 The cemetery sits on pleasingly rising land to the south-east of the city centre, as the hills climb away into Thorpe. In the 20th Century, it would be joined nearby by Norwich City's extraordinary former football ground, the Nest, which was almost adjacent - have two such unlikely neighbours ever existed in East Anglia? This part of Norwich became rapidly built up in the middle years of the 19th Century, mainly with the kind of middle-class villas still to be found on Thorpe Road and Riverside Road. Non-conformists tended to be poor in the early years of the Rosary, but it was in the second half of the 19th Century that the glory years of the cemetery began. In 1860, the strangely industrial-looking Gothic lodge at the entrance was built to the design of JS Benest, and then in 1879 it was joined by this fabulous little chapel, the finest work of Edward Boardman. It looks like something out of Le Grand Meaulnes; it is an impressively ornate French Gothic horror just ready for a coach and four to be driven under the porte-cochère in a wintery thunderstorm by a whip-cracking driver. But I like to explore the Roasary in late spring best. Its tight site, much smaller than similar cemeteries in other cities, means that the graves are squeezed into the rolling, climbing landscape, often in rows, and sometimes higgledy-piggledy. Thomas Drummond, the founder, is buried with his wife Ann not far to the south of the chapel. Their curious neo-classical memorial is hidden quietly beneath a tree. Ann was the first person to be interred in the cemetery, her body reburied here from Colegate Meeting House burial ground. Around them, and up the hill to the east, spread the thousands of others who have been laid to rest here in the years since. There are too many highlights to mention them all, and in any case you will want to explore this remarkable place for yourself, but there are ninety-odd images below of some of the memorials I like best. To mention some of the more significant, you won't in any case miss the large mausoleum to Emmanuel Cooper, just to the soth-east of the Drummon memorial. It was finished in his lifetime, and he often walked up here on a Sunday afternoon to sit in its entrance, smoking his pipe. Cameron Self of Literary Norfolk tells us that Cooper's daughter, the spendidly named Ada Nemesis Cooper, married the writer John Galsworthy. It is said that the family life of the Coopers inspired Galsworthy's most famous novel, The Forsyte Saga. By a pleasing act of symmetry, Galsworthy's biographer RH Mottram, the antiquarian and novelist who died in 1971, is buried under a far simpler and alarmingly leaning headstone a short way off. Mottram, a member of the congregation at the Octagon chapel as Thomas Drummond had been, was the last chair of the trustees of the Cemetery, before it was conveyed into the care of Norwich City Council just over half a century ago. The story since then seems to have largely been one of neglect, but there is a very active preservation group now working to restore the cemetery. Beside the Barker memorial is one to Charles Thurston, Amusement Caterer. Barker had married into the Thurston family, and Thurston's fairs still tour England today. Another imposing sight is the plot dedicated to the famous Colman family, who were fire-breathing non-conformists. Curiously, their space is marked by two massive sentinels, one a column inscribed with some of that old misery St Paul's more doom-laden observations, and the other an elegant Saxon cross. On the ground around are stones bearing wholly secular memorial inscriptions. To the east are a number of simple headstones to those who worked on the railway at the bottom the hill. Inscriptions remember one who was for 36 years Inspector at Thorpe Station, while another was 34 years a guard on the GE Railway. Uncomfortably close to these is Joseph Hall Parnell, accidentally killed at Thorpe Station in 1882. Another stone has a now badly eroded image of a stream train in full flight. Slightly up the hill from here is Joseph Stringfellow, who sailed the river weaters clear - and, indeed, the gravestone has a carving of his little boat. More impressive is the stately galleon crossing the ocean on another headstone. Coming westward again, the artist Henry Housego is represented on his headstone by his palette and brushes. Sir George White, MP for Norwich in the late 19th Century, who laid the foundation stone of several of the city's Baptist churches, is familiar from the the inscriptions on them which can still be seen today. His last inscription is here. Another great Saxon cross nearby is to members of the Jarrold family. Perhaps the most poignant memorials are to children. A lot of children died in the cramped, unhygenic courtyards of late 19th Century Norwich, sometimes several from the same family in a very short space of time. Other heartbreaking memorials include one to a young mother, and then our only child a few weeks later. There are other crosses, and there are angels - but not many. One of the aspects which gives the Rosary its special character is a seriously non-conformist gravitas, a quietness at one with the setting. The gravestones may be tightly packed, but they have a sense of the private, non-sacramental lives their dedicatees once lived, a feel of the the great City of the late 19th century which has somehow survived here, a city renewing and replicating itself. The civic pride and continuity which would last well into the post-WWII period is still to be felt here, discernible and, indeed, legible; for every cemetery is a palimpsest. This place is one of Norwich's well-kept secrets, off the tourist trail and deserving of far more visitors than it will ever get.